I’d been eyeing it for a while and when I saw it at Costco for a really good deal…well, somehow that book just snuck into my cart and followed me home. I was in my room, parked in front of a fan and marveling at all the clever ideas when KT came in to chat with me. Of course, my nosey girl wanted to know what I was looking at and arm wrestled the poor book away from me. 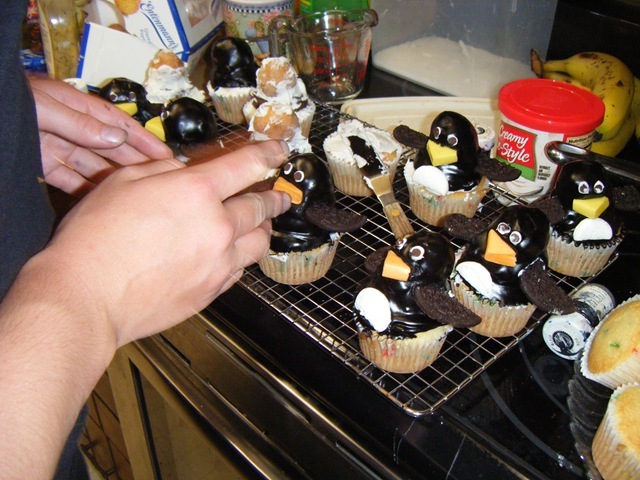 The next thing I knew, she had me at the store buying all sorts of things to make some fancy Penguin Cupcakes. She was planning on going to one of her friend’s birthday party the next day and desperately needed to make these cupcakes immediately for her friend. Once we got home, I ran off to hunker in front of the fan once more and left her to bake the cupcakes. I had barely gotten settled when my little vegan appeared before me and asked me if I would help her as she wasn’t comfortable using eggs. Somehow, I was once again duped into doing what I didn’t want to do. In this case, mix together (I prefer to bake from scratch but apparently “Funfetti” cake mix is all the rage) and set the cupcakes. I set the timer and told KT that she was all set. Then I proceed to grab my fan and an extension cord and nestled into the closet. 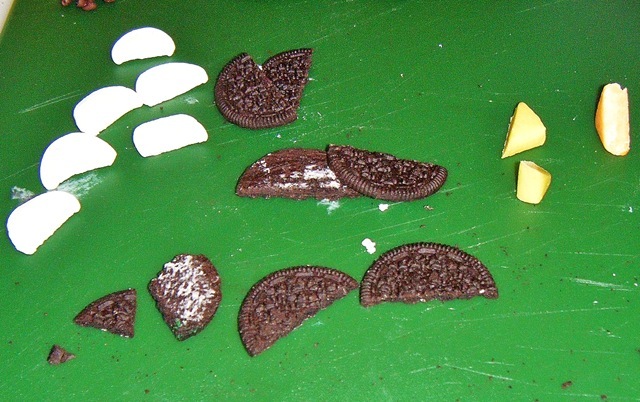 While I was getting my hands dirty, KT set to work slicing up marshmallows and cutting up candy and cookies to create the various penguin parts. I still haven’t figured out how she got the easy job. We quickly worked together to create a small flock of adorable penguins. I was all set to reclaim my Good Mothering Crown and plop down in front of my lonely fan once again when KT started giggling to herself and fixed her evil eyes gave me her best “I’m such a wonderful daughter” smile. She had the clever idea to add a few colorful penguins to the flock just to liven things up. With a big sigh (because I had finally figured out that it was futile to try hiding) I pulled my mixing bowl back out and started making a batch of frosting. 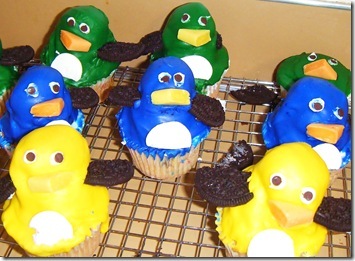 KT requested that I create just a few yellow, blue and green birds and then headed off to take a shower. (she did have to work the next day and it was getting quite late by this point) I suspect that she had envisioned some sweet pastel tints because her eyes nearly popped out of her head when she saw the vibrant colors that I had created. Now all I have to do is be careful what books I bring home from now on. 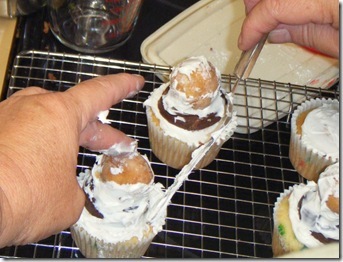 This entry was posted in Cooking, Critters, Food, KT. Bookmark the permalink. OMG, they are sooooo cute! I am gunna give them a go tomorrow with the kids! What did you stack on top of the cupcake to make the head? It looks like donut holes. They’re adorable. I’ll give credit where due. Great job, Susan. You’re the penguin queen. Wow! Are you a great mom or what!! They are so cute!! So cute! I’m so impressed. Those are very cute…KT did a fabulous job ;-D LOL! They are gorgeous! I really must have a go. Trouble is, cakes straight out the oven don’t usually stay around long enough in my house to be decorated with anything! Hmmm, I wonder if a few of those would survive mailing to Iowa. Not that I’m suggesting anything. Good job girl! I wrote a long comment just a moment ago, but lost my internet connection and darn if I am going to that much effort again! 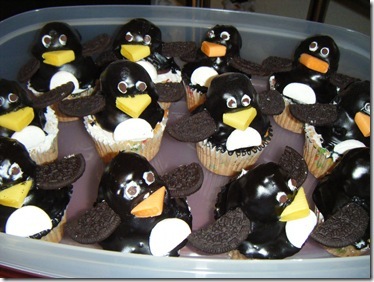 Your (KT’s) penguins look delightful. Wow, this is one of those times that the rest of us feel like underdeveloped mothers. Bravo and again bravo, whenever I try something like this it turns out to be a free art form, a lot of colour but no shapes. Your penguins look fantastic! Looking forward to seeing what else you create from this book. Those things are FREAKING awesome. I was waiting for the punchline to be that they turned out looking like heaps of tragic crumbs…but heck…they kick. I like that she wanted to take cupcakes to a bday party. Most kids just expect to get them there.